NEWS CORP chairman Rupert Murdoch has told the Leveson inquiry into media ethics that his globe-spanning TV and newspaper empire doesn’t carry as much political sway as is often believed, and that he wasn’t the power behind the throne often depicted by his enemies. Speaking softly, deliberately and with dry humor, Murdoch sought to deflate what he described as myths about his business, his agenda and his friendships with those at the pinnacle of British politics. The 81-year-old media baron denied ever calling in favours from British leaders and dismissed the oft-repeated claim that his top-selling daily, The Sun, could swing elections. “We don’t have that sort of power,” he testified. Murdoch was being quizzed under oath before an inquiry run by Lord Justice Brian Leveson, who is examining the relationship between British politicians and the press, a key question raised by the phone hacking scandal that brought down Murdoch’s News of the World tabloid in July. Revelations of widespread illegal behavior at the top-selling Sunday publication rocked Britain’s establishment with evidence of media misdeeds, police corruption and too-cozy links between the press and politicians. Murdoch’s News International — the tabloid’s publisher — has been hit with over 100 lawsuits over phone hacking and dozens of reporters and media executives have been arrested. Showing little equivocation, Murdoch batted away challenges to his ethics by inquiry lawyer Robert Jay. Asked whether he set the political agenda for his UK editors, he denied it. Asked whether he’d ever used his media influence to boost his business, he denied it. Asked whether standards at his papers declined when he took them over, he denied it — and threw in a quip about his rivals. The inquiry was set up by Prime Minister David Cameron following the scandal’s resurgence in July. Murdoch’s testimony was among the most heavily anticipated — not least because of his close links to generations of British politicians, both from Cameron’s Conservatives and the opposition Labour Party. 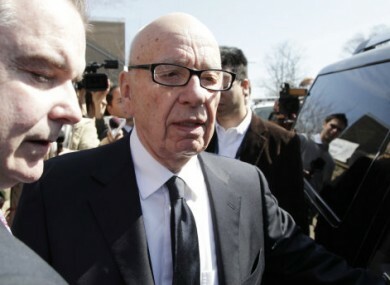 Murdoch made few concessions to his inquisitor. He denied that former Prime Minister Tony Blair of the Labour Party had consulted with him on how to discredit French leader Jacques Chirac in the run-up to the 2003 invasion of Iraq. He denied strategising with Blair’s successor, Gordon Brown, on whether to call a snap election. And he denied lobbying Cameron on issues including broadcasting regulations, the ins-and-outs of which have since helped feed the scandal. He did reveal a tense telephone exchange with Brown in September 2009, after the tycoon had decided to throw The Sun’s support behind rival Cameron. Brown released a statement Wednesday characterising Murdoch’s version as false. “I hope Mr Murdoch will have the good grace to correct his account,” Brown said. But he denied that his personal friendship with Blair had led to any favours, thumping the table to punctuate his sentence. “I never. Asked. Mr. Blair. For anything,” he said. Media-watchers have speculated that Murdoch would seek to inflict political pain on the Cameron’s Conservatives, rumors which gained force when his son James gave damning testimony about British culture secretary Jeremy Hunt on Tuesday. The younger Murdoch released documents that suggested that Hunt, a Cameron ally, had secretly smoothed the way for News Corp’s bid for full control of the British Sky Broadcasting Group PLC, a lucrative satellite broadcaster. The bid was contested by Murdoch’s competitors, who feared that if News Corp increased its stake in BSkyB, it would reinforce his dominance of the British media landscape. Hunt had told lawmakers he would be impartial, but the documents showed his department giving News Corp behind-the-scenes advice and intelligence. Hunt’s political aide Adam Smith resigned Wednesday, saying he was responsible for the perception that News Corp had “too close a relationship” with Hunt’s office. Smith said he had acted without Hunt’s authorisation, but it was not clear how a special adviser could have acted so independently. Although Murdoch was cooperative with the inquiry on Wednesday, he evoked a healthy helping of the phrase “I don’t remember,” particularly when confronted with potentially embarrassing anecdotes about his alleged remarks. At one point, Jay quizzed Murdoch about a gleeful comment in which Murdoch took credit for smearing his left-wing opponents. “If I said that, I’m afraid it was the influence of alcohol,” Murdoch replied. So determined was he that Murdoch appeared to claim he was totally blind to business considerations when deciding which politicians to back. “You’re completely oblivious to the commercial benefits to your company of a particular party winning an election. Is that really the position?” asked a skeptical-sounding Jay. His testimony resumes on Thursday. Email “Leveson: Rupert Murdoch plays down political influence”. Feedback on “Leveson: Rupert Murdoch plays down political influence”.